A set of 4 cross stitch machine embroidery designs - 2 cross stitch poppy flowers and 2 cross stitch butterflies. Each of the designs is available in 2 sizes. The smaller size will fit in a 5 x 7 inches (130 x 180 mm) hoop. 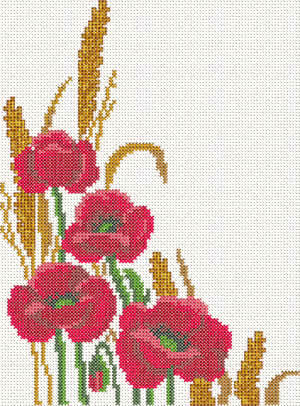 The large poppy designs are available in JEF+, PES, DST and VP3 machine embroidery format.